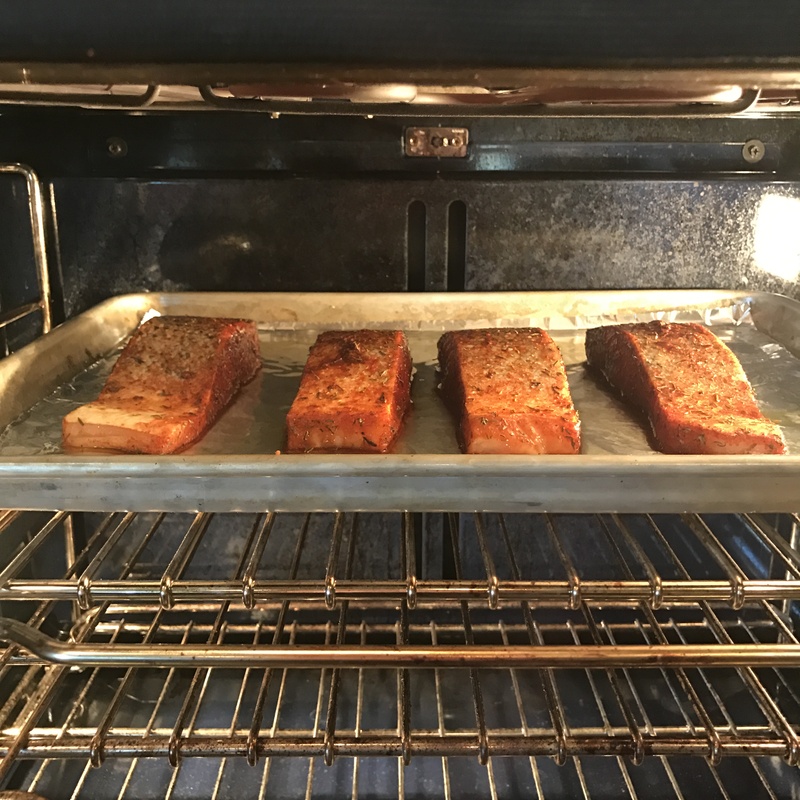 Today I wanted to share with you all one of my favorite go to recipes for 8-Minute Broiled Salmon. This delicious salmon recipe cooks in literally 8 minutes and I promise you the butteriest, most delicious piece of fish you have ever tasted. Now there are a couple of secrets to making this melt in you mouth salmon and the first one is the dry rub. 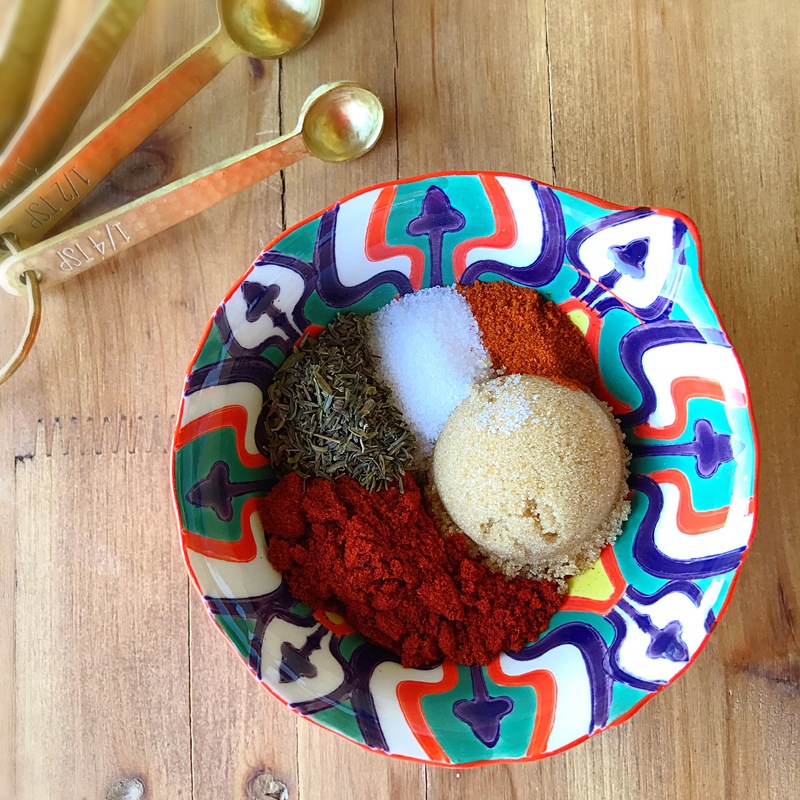 My Salmon dry rub is the perfect combination of smokey, savory, spicy, and sweet. That “sweet” comes in the form of brown sugar and creates a mouth-watering caramelized crust on the salmon underneath that broiler. The second secret is you have to buy good quality, fresh salmon with the skin on. The skin provides an extra layer of protection (fat and flavor) that helps keep the salmon buttery and tender. Now, I know some of you might not be the biggest fish lovers but don’t worry you don’t have to eat the skin it slides right off after cooking. 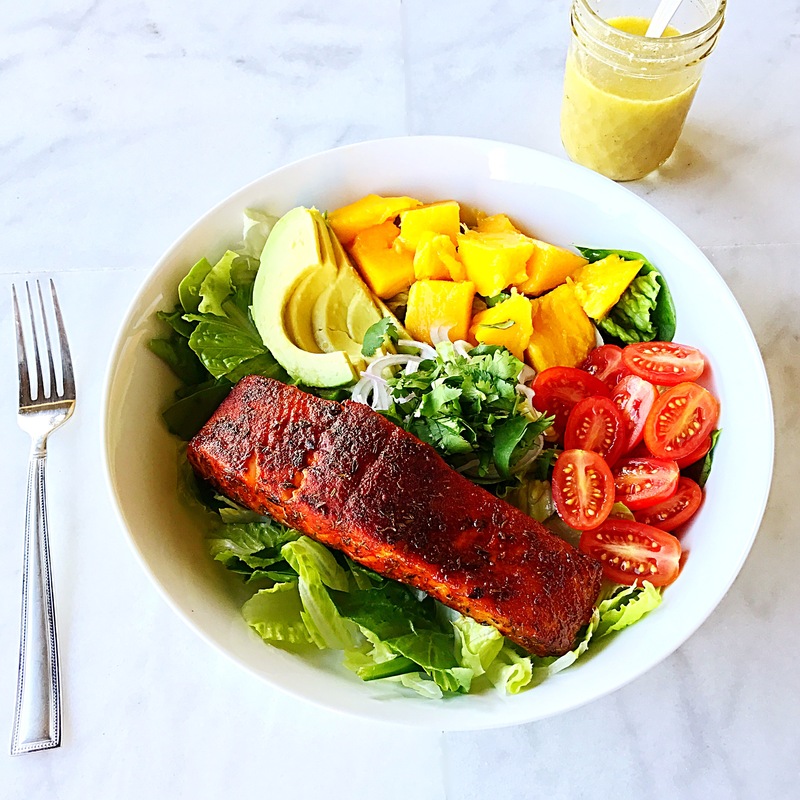 But my all time most favorite way to serve this salmon is with a tropical romaine salad topped with avocado, tomato, mango, cilantro, shallot, and a lemon vinaigrette. Yum! Buttery salmon and sweet juicy mango is so out of this would good! Add the smoked paprika, brown sugar, thyme, sea salt, cayenne pepper and black pepper to a small bowl stir to combine. 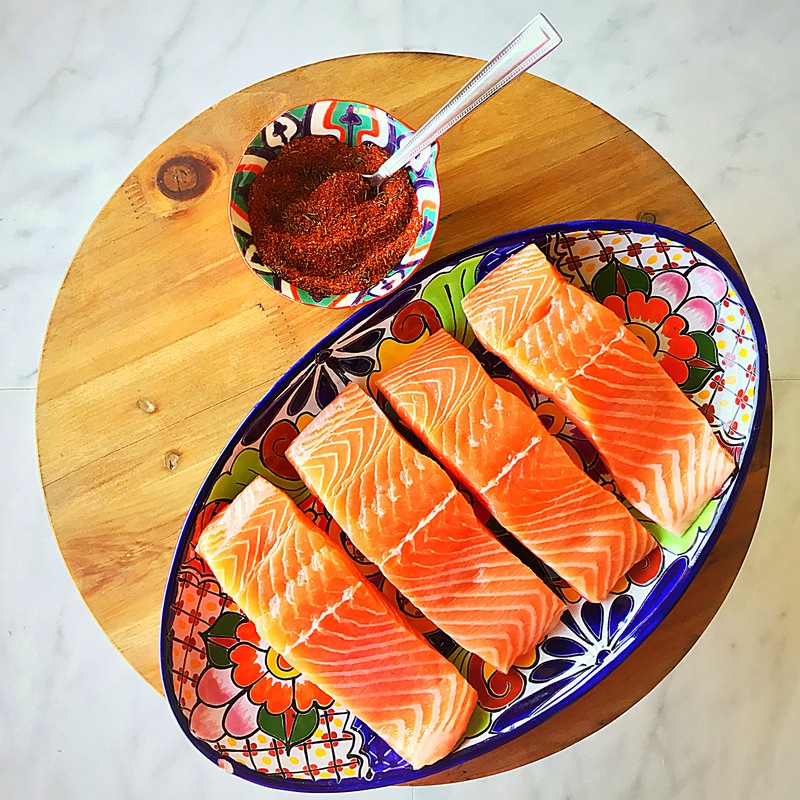 Place the salmon on a plate or tray skin side down then generously rub all the spice mixture over the top and sides of the salmon. Cover with plastic wrap and allow the salmon to marinate while preheating the broiler. Now for the tricky part… Pre-heat your broiler for 5 minutes. Lets talk ovens. I have an electric oven with an overhead broiler and 5 optional rack positions. My broiler has 3 heat setting high, medium, and low. For my oven I use the medium heat setting and the second rack position from the top. If your oven only has a high/low setting use the high heat setting and the middle rack position. Line a baking sheet pan with aluminum foil and drizzle on a little extra virgin olive oil. 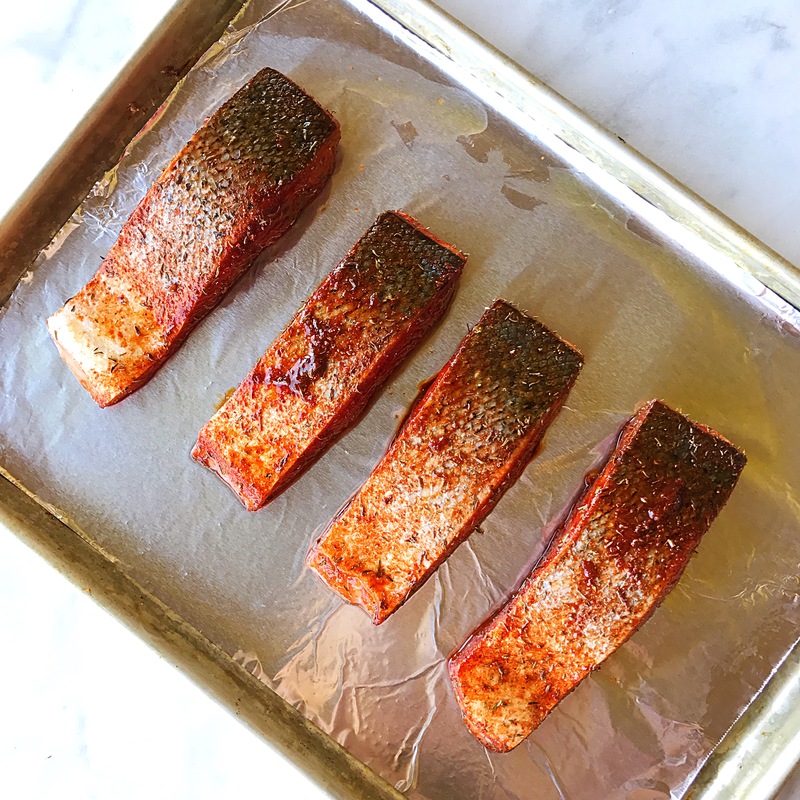 Place the salmon on the greased sheet pan skin side up then put in the oven under the broiler and set the timer 4 minutes. With a pair of tongs quickly turn the salmon over (skin side down) and set the timer for another 4 minutes. Remove the salmon from the oven squeeze over a little lemon juice and tint with foil. Allow the salmon to rest for 5 minutes. Wow, now that is my kind of salmon rub! Howdy Mel! Thanks Kathryn 🙂 Brown sugar always works wonders doesn’t it!! Hi Melody!! This looks so inviting! Love all the bright colors together — and with salmon, avocado & mango (3 of my favorite tastes!). Are you all settled back home after your trip to Chicago?? It looked like a really interesting, fun time! Fun to fine your new post! hugs hugs. I totally agree with you, salmon, avocado and mango are one of my favorite flavor combinations too. Great to hear from you!! Hope all is well in sunny California!! P.S. I just saw I had another comment from you from a week ago and I don’t know home I missed that. Sorry about that!! 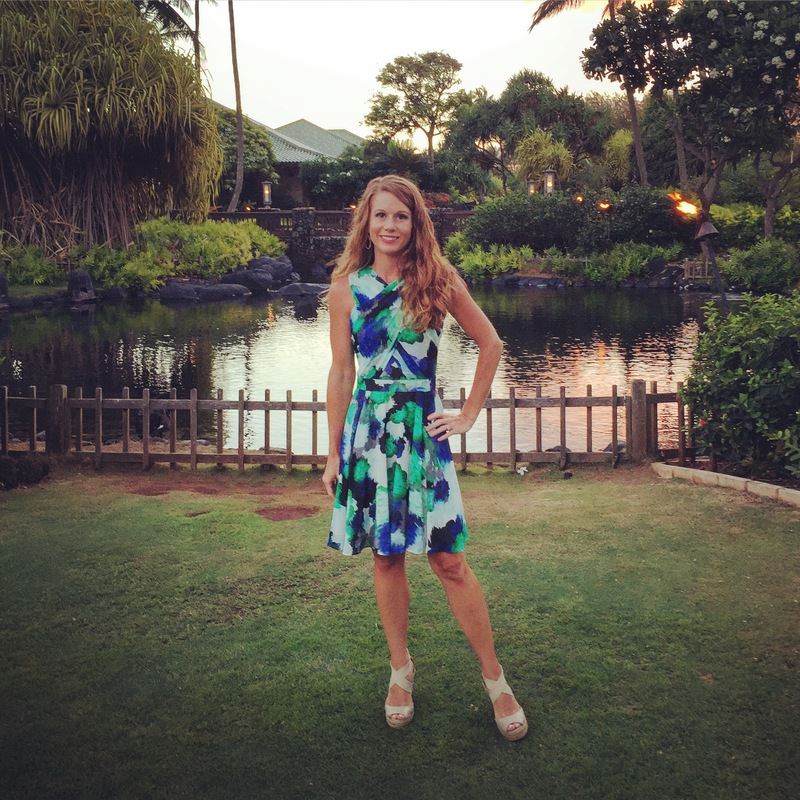 OK, Melody– the International Housewares Show sounds awesome! (I saw the photo of you by the giant Kitchen Aide mixer!!). Do you have to be somebody to get into that show, or can any old cook slip in?? And– we are having a good week. My daughter is here from Wisconisn with 3 of her coworkers doing photo shoots for their photo website. Fun to sit down to dinner at night and get to know them… Take care– and love the salmon recipe– Have it copied to try! hugs hugs! So to get in to the housewares show you have to prove that you are a “buyer” of products. Glad you like the salmon recipe you will have to let me know what you think if you give it a whirl. Sounds like you are having a fun time wth you daughter and her friends! I bet they are loving al the delicious food you are making for them. Thanks Tonya 🙂 yeah I thought it would be good to post a recipe for a quick and easy meal. Especially since we are coming up on the summer months when no one feels like standing around the kitchen for hours cooking. Hope you and farm guy had a great trip across the pond!! Your recipe is perfect for spring and summertime meals. I hope you and Doug are well. It looks like y’all have been doing some fun traveling, too! Thanks Vanessa ☺yeah I know people either ❤️ cilantro or HATE it. Try basil with the salad. Mint is another great substitute too (mint and mango are great together). Great recipe, Mel. As all broilers are different, I’d use a thermometer and broil to a core temperature of 115 degrees before resting. This would also work on an outdoor grill. Thanks Stefan!! Good tip too about using the thermometer too! I’ve posting some recipes lately that I’d love to get your feedback on, like carnitas and shrimp albondigas.